Some quick and easy ways to make a few bells are listed in this guide. Grab your net and go bug hunting! This guide will show you all the bugs along with the times that they are available to catch. Ever wonder what happens up in that night sky in Animal Crossing? This guide will tell you everything that you need to know. Do you feel your character is a bit emotion-less? Take a trip to the Theatre and use this guide to get the emotion that best suits your mood. Check out the calendar to see what special happenings and events will be going on in your AC town throughout the year. Just moving in to town? Come and get the right face for your character. The art of Feng Shui is explained here. Grab your Fishing Rod and go fishing. This guide will show you all the fish along with the times and seasons that they are available to catch. This handy guide lists all the fossils that you can get in City Folk. It's summer, and everyone loves the sun. Find out about tanning here. Fed up or not getting the most from your tools? This guide will tell you how to upgrade your tools, and get better tools. Want to make your house a little more interesting? Collecting gyroids can be fun, but there are tons of them! Find out about them here. Want a new Hair-do? Go to Shampoodles and use this guide to get the perfect hair for your character. Need a bigger house? Come here to see what is on offer. Want a nice looking house that we be the envy of the town? Use this HRA guide to get the most from your house. Be the envy of others with hybrid flowers in your town. This guide tells you all about them. Use this handy-dandy tool to search/sort items in various categories such as furniture series, furniture themes, fossils etc. Want to see K.K. Slider play, but don't know what to listen to? Use this guide to pick the exact song that you want to listen to. All songs are listed here. Would you like the best town in AC? Come here to find out how to achieve a perfect town. Want to learn more about a few of your often boring town characters? Come here to find out how. We all know he is CRAAAAZY... Use this guide to make sure that you are not getting something that you could find cheaper. Tired of the same ol’ shoes? Come here to find out how to make your shoes all new and spiffy looking. It's winter and everyone likes a snowman. Come here to find out how to build them. Your town is not limited to those that live there. Many special characters either visit or are a part of your town too. This guide lists them all for you. Tom Nook and his stores. Come here to find out all about them. Ever been to Katrina and wondered what she is going on about? This guide will tell you all about the Town Charms that visitors can do in your town. Want that extra special axe? Come here to find the best way to get one. Want your town to grow? Come here to find out how to get more stuff in your town. Do you like growing trees? Come here to find out all about trees. A simple guide on how to get the screenshots from your game to the web to show off to your friends. A guide on how to use the DS Suitcase mode to travel to other towns or transfer your AC: WW character. 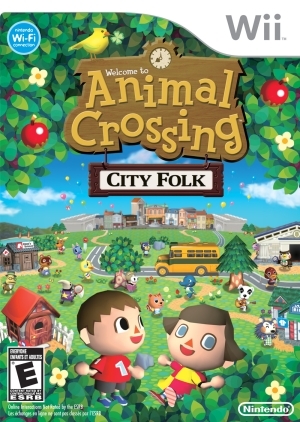 A comprehensive chart of all the villagers that are available in City Folk. In AC:CF, you can find a walrus wandering your town. If you feed him, he'll give you a pattern. This guide will give you a key on what to give Wendell to achieve whichever pattern you desire.